Pizzeria at the Seaport District's Fan Pier. : Boston's waterfront is one of the hottest places to open a restaurant, even if it's a pizza joint. 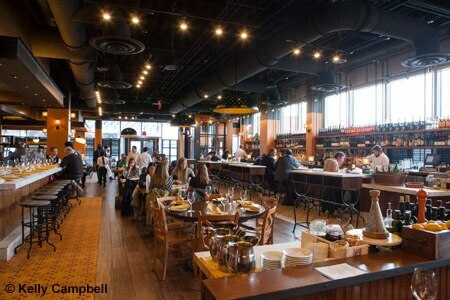 Located at the Seaport District's Fan Pier, the restaurant focuses on Italian favorites like ricotta calzones, fritto misto, pizzas in all forms (think meatball, mushroom, prosciutto and arugula, and goat cheese and pistachio, to name a few) and spaghetti carbonara with pancetta. There are also some unique finds such as crispy duck leg agrodolce, oxtail gnocchi and sweet pea agnolotti. We like pairing a draft of Italian beer, perhaps Collesi 'Bionda,' with our pies and starters of sweet Italian sausage or razor clams before moving on to the likes of egg yolk raviolo and tagliatelle Bolognese. Be sure to save room for a taste of Italy with ricotta cheesecake and olive oil coppetta served with olive oil gelato.